short girl, long island. : January Cara Box Reveal. Last month, I posted about how I finally jumped on the Cara Box bandwagon. I loved it so much, I decided to participate in January as well! This month I was paired with Jody + Jennifer. While I did a bit of research to decide what to send Jody, Jennifer did her own digging to figure out what to get the girl who doesn't make resolutions for the new year. I was super stoked to get my package in the mail + couldn't wait to see what Jennifer chose for me. The card was perfect, as I adore animals. As soon as I saw a Star Wars reference, I knew she had done her homework. Erich was next to me when I was opening it + even HE got into it, which is surprising. Probably because he wanted some of the goodies she included. I had mentioned to Jennifer that although I wasn't making resolutions, I wanted to make a conscious effort to eat healthier. She sent me yummy snack mix + chocolate tea [a girl after my own heart]. She also sent me one of my favorite Burt's Bee's tinted lip balm, which is perfect, as my last one was in a hoodie + made friends with the washer + dryer [whoops]. She also snagged some awesome Star Wars goodies for me, too! 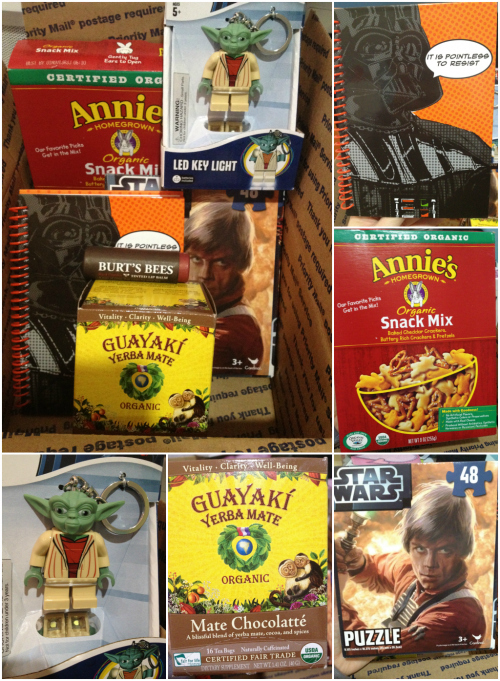 There was a small comic-themed Vader notebook [perfect to stash in my bag], a fun puzzle + my favorite piece of all - a LEGO Star Wars Yoda light key chain! She went above + beyond to pack my Cara Box full of goodies, which was the highlight of my week. Make sure you swing by + say hi to all of these lovely ladies + don't forget to swing by Wifessionals to sign up for the February Cara Box! Wow! How neat is this?!! I'm loving checking out what everyone got in their Cara Box! So awesome -- I love the Annie's snack mix, we go through a ton of that in our house!